My apologies if this has been discussed, I did a search and didn’t see anything. We have log files with very long file names (contains GUIDs). Even set at 1080p, multiple open files results in just 2 file tabs visible at once. I realize that we can enable multi-line tab bar, but this can also result in many, many lines. I would really rather have truncated file names with ellipsis, with a popup-hint showing the full file name. 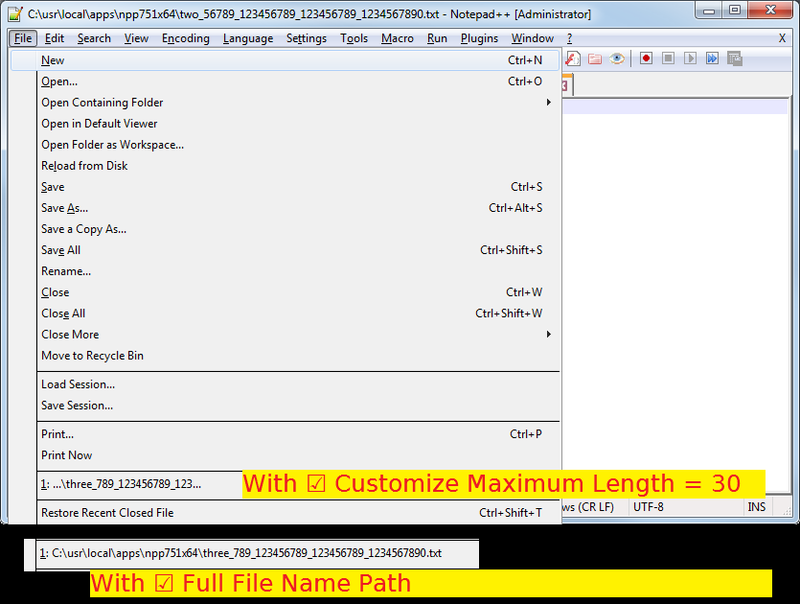 An optional maximum tab width that will auto-trim the file name if that length would be exceeded. Did you know that Notepad++ can display in a tab a filename of at least one hundred characters ? Did you know that for a screen resolution of 1920 by 1080 Notepad++ can display at least two such large tabs ? the very useful “Customize Maximum Length” option. Did you use it ? That setting does not do what @robdjohansen is asking for. If the requested feature is badly needed right now, I would suggest using the PsPad editor, which lets you customize the maximum length of the file name shown on each tab. Does enabling the doc switcher (Preferences->General) suit you? Depending on your monitor layout you could dock it at the top and see the whole name, or dock it on the side and when you hover, it shows the whole name of the file. created a new file called “qqqqqqqqqqqqqqqqqqqqqqqqqqqqqqqqqqqqqqqqqqqqqqqqqqqqqqqqqqqqqqqqqqqqqqqqqqqqqqqqqqqqqqqqqqqqqqqqqq.txt”. My 7.5 version of Notepad++ was happy to display this long filename in one tag. @NippurDeLagash What did you do to test the “Customize Maximum Length” option ? To test it: I created three files, name length = 85 characters, and set “Customize Maximum Length” to 20 characters. Then I opened the three files, and the three tabs display the full name, with all their 85 characters perfectly visible, not what @robdjohansen needs. The desired effect is that each tab displays only the first 20 characters. If you look at the Recent Files list, all the file names are limited to the first 20 characters. That’s because “Customize Maximum Length” applies only to the file names in the “Recent Files History”, not to the file names shown in the tabs. FYI the version 7.5 is happy to display the very long filename in the “Recent” files list as well. You two seem to be talking at cross purposes. I opened them all in a fresh portable-unzip of Notepad++ (7.5.1 64bit), then closed three_789_123456789_123456789_1234567890.txt, so that three_789_123456789_123456789_1234567890.txt would be in the MRU. I then took two screenshots of the file name tabs, under the same two conditions: This behavior does not change with that option. @Gogo-Neatza, please notice how that option does not affect the tab list: it still shows the full file name in the tab title list, whether or not the option is set. @robdjohansen requested an option to be able to shorten the filenames in the tab title list, and @NippurDeLagash keeps trying to explain to you that your suggestion does not address that request. FYI: I also tried the same experiment in my normal installation of 7.4.2 32bit, with the same results (not shown). It’s not a difference between 7.4.2 and 7.5.1. The “Recent Files History” settings just don’t affect the names listed on the tab bar: as @robdjohansen requested, there really needs to be a separate option for the tab-bar names – probably in the Settings > Preferences > General > Tab Bar area. Thank you Peter! That is exactly right and the screen shots show it perfect. And thank you NippueDeLagash for your support as well.